Northumberland County is located between Lake Ontario and the Trent-Severn Waterway. Northumberland County trails are also part of the Central Ontario Loop Trail which brings 5 counties together to form one large trail. Click on the map below to bring up the Northumberland County Map. An NDATV Trail Map is included in the package obtained with a NDATV membership. Memberships can be purchased from these sponsors. 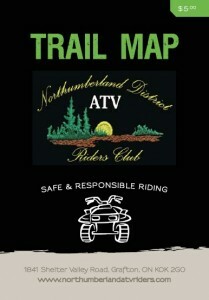 An NDATV Trail Map can be purchased for $5 dollars with the purchase of a Day or Weekly trail pass. Click for trail permit’s prices here. Click on the map below to bring up the ATV Clubs of Ontario Map.